Azzurra Castle is just the place for families or four couples to vacation together. There are six air-conditioned bedrooms, including a master loft with a seven-by-seven foot bed. The villa is located on a sheltered cove, and has a beach for you and your guests to enjoy. There’s even a “dungeon”, where guests will find the home theater, office, exercise room, and reception areas. A short drive will take you to golf, tennis, water sports, and the airport. The villa has a housekeeper who also cooks, and a laundry is available for guests. Azzurra Castle sits on a private beach, with ocean views and lush gardens. 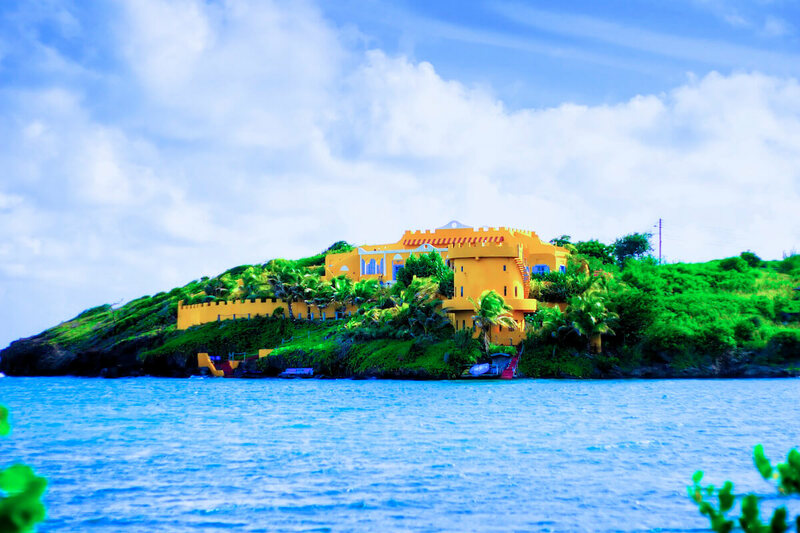 Thick archways, columns, turrets, and Moroccan accessories add to the castle atmosphere, and the color palette, beachfront location, and island breezes are quintessentially Caribbean. Old World, walled gardens greet guests in the outer and inner courtyard. The Great Room holds the bar, kitchen, dining room, breakfast nook, and the lounge. A large archway opens to a staircase that leads down to the lower level, where guests will find the pool and four of the bedrooms. Guests can sunbathe on the deck surrounding the pool, or walk through the bay gardens below. The three guest bedrooms and the two-story master suite all face the pool area, each with ensuite bathrooms and exterior access. The master suite is a true oasis, with a king-sized bed, custom bath, its own sitting room, and a private patio deck. There’s also a staff bedroom behind the kitchen, next to the laundry room. On the lower level, guests can find the den, which holds a media room, fitness center, and conference room. There’s a three-story tower on the other side of the property, down by the sea and gardens. It holds the master suite, a guest bedroom, and a rooftop deck. The master suite is set up like a studio apartment, with a queen-sized bed, a bar, and a kitchenette. The guest bedroom has two twin beds, and is ideal for children. There’s a BBQ area and boat dock outside the tower, so guests can explore the coast on kayaks and paddle boards. Guests also have access to Mount Cinnamon Beach Resort’s tennis, beach cabana, non-motorized water sports, spa, and massage cabana with a broad menu of treatments. Azzurra Castle has a house cat and dog (family friendly) however, they can be kept from the guests if preferred. On its own sheltered cove with a small strip of sand-and-rock beach and a sandy bottom for swimming + snorkeling; there are 2 swim platforms. Grand Anse beach is a 10 minute drive from Azzurra Castle. Upon arrival to the airport in Grenada, guests will be greeted by a member of the villa management team and transferred to the villa. On departure, guests will be transferred back to the airport. Car rental, butler, grocery and beverage shopping (pre-arrival and during your stay), liquor and wine delivery, nanny service, baby equipment, spa services, yoga and personal training, and photography can be arranged for an additional fee.